Henri Desgrange: Racing cyclist and French sports journalist. (Paris 1865 - Beauvallon 1940). Between 1893 and 1895 he held twelve world track cycling records. Prominent among these was the hour record (35.325 kilometers, May 11, 1893. His name remains associated with the Tour de France which he founded in 1903. He is also remembered as one of the founders of the periodical L'Auto. In 1892, Pierre Giffard founded Le Velo, widely considered to be the first sports newspaper produced in France. He formerly had been a journalist with the daily Le Figaro before becoming desk editor of Le Petit Journal, on whose behalf he had created Paris - Brest - Paris the year before, in 1891. From its inception, this new publication faced competition from several rivals. Principal among these was Paris-Velo directed by Henri Desgrange a determined cycling competitor and, in 1897, to become one of the founders of the Parc des Princes (Trans. note: until recently, the most important sporting venue in Paris). This undesirable competitor was easily marginalised, and Le Velo came to dominate the French sporting scene. However, the paper's influence soon found its limits. Pierre Giffard was imprudent enough to openly side with Dreyfus. (Trans note: Dreyfus was an officer in the French military accused of treason and, not insignificantly, a Jew: his trial was socially divisive and a defining moment in late-nineteenth century French history.) This willingness to use the publication to serve his political ends did not sit well with a good part of his readership, with the consequence that Baron de Dion and other industrialists broke with Le Velo and started to think about the creation of a rival publication. This was to become L'Auto-Velo. The founding of L'Auto-Velo took place at the time of the Exposition Universelle (Paris World Fair) and the Olympic Games, on October 16, 1900. Baron de Dion conferred the direction of the new publication on Henri Desgrange, who took on Victor Goddet to assume day-to-day management. The mandate of the journal was to promote automobile and the cycling commercial enterprise. Le Velo and L'Auto-Velo became embroiled in a bitter competition. While the newcomer benefited from the innovation of special correspondents who relayed results from all the important races, and from an emphasis of the international dimension of the sport, its rival possessed a significant advantage: its patronage of several of the most important bike races. L'Auto-Velo hung on by using clever tactics. For instance, eight weeks after Le Velo had held the Paris-Bordeaux cycle race, Henri Desgrange organised a similar race on the same race route. The winner of this later race beat the time of the winner of the first race by four hours. The growth of sales of the new publication reacted positively to this exploit. Le Velo responded by attacking L'Auto-Velo on the legal front, for infringing on the journal's name. The court found in Giffard's favour and Desgrange was compelled to amputate the name of his paper. L'Auto-Velo became L'Auto on January 16, 1903. 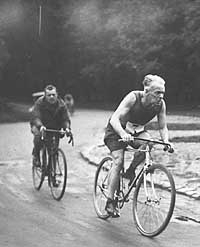 Battered but not beaten, Henri Desgrange took up the idea of one of his colleagues, George Lefevre, to organise a race on a large scale: the Tour de France. The administrative head of the group, Victor Goddet, taken up by the idea, came up with the necessary funding. The start of the first Tour de France was planned for the 1st of July, 1903. 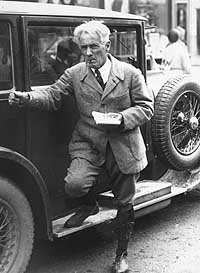 Using the same methods as his predecessor Richard Lesclide, Henri Desgrange ensured the success of the Tour through its promotion in L'Auto, and the success of the Tour was important to the promotion of the newspaper. It was no mistake that the leader of the Tour de France wore a jersey coloured yellow. Yellow was the colour of the paper on which the newspaper was printed. Le Velo never recovered from the growing popularity of its rival and ceased publication in November 1904. Following the creation of the Tour de France, for the next forty years, L'Auto came to dominate the sporting press in an almost monopolistic fashion. The paper's headquarters, at 10 rue du Faubourg-Montmartre, would never be troubled by its nearest competitor - L'Echo des Sports - which collapsed very quickly. L'Auto, which had a circulation of 300,000 throughout the 1920's saw its sales double during July, the month of the Tour de France. But from 1935, the paper began to face competition from the sports pages of the general press - particularly those of Paris-Soir, and from sports-specific publications. On losing ground, L'Auto fought back by changing its format under the direction of Jacques Goddet (son of Victor) who was the young editor-in-chief at that time. He took over direction of the publication with the death of Henri Desgrange in 1940. During the difficult time of the Occupation, he kept the publication going: something for which he would later be reproached. L'Auto ceased publication the 17th of August 1944, just on the point of the liberation of Paris. Blacklisted by the press ordonances of Algiers, the newspaper was banned and, on Liberation the assets of the journal were sequestered. Eighteen months later, the natural child of the L'Auto would be born under another name: L'Equipe.